First off, Lime' Crimes Lip Noir's aka Lipsticks. This is what Lime Crime is famous for! Their ridiculously pigmented and bright lipsticks! And the obnoxious amazing bright Pink packaging with the Silver Holographic Unicorn on the side! :D If you couldn't tell I love the packaging! Description: "Say goodbye to sliding, fading and sheer-ness with our best-selling opaque lipsticks. Loaded to the brim with pigment for maximum impact, these beauties offer unparalleled coverage in a rainbow of statement-making shades. Cruelty-free/vegan formula is smooth, non-drying and lasts for hours. 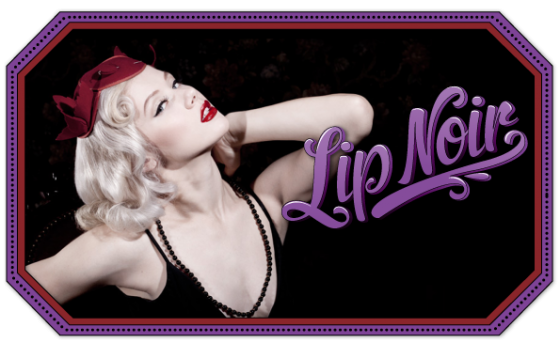 Each lipstick comes encased in the signature purple tube adorned with a sparkling unicorn." Everybody has been raving about these New Carousel Glosses,which I am sure you have already seen swatches somewhere before. This is what I was most excited about because of how PIGMENTED these are!! Description: " boasts semi-opaque coverage combined with bursts of nebulesque sparkle that comes alive in indoor lighting. Cruelty-free/vegan formula glides on smoothly on bare lips or over your favorite lipstick. 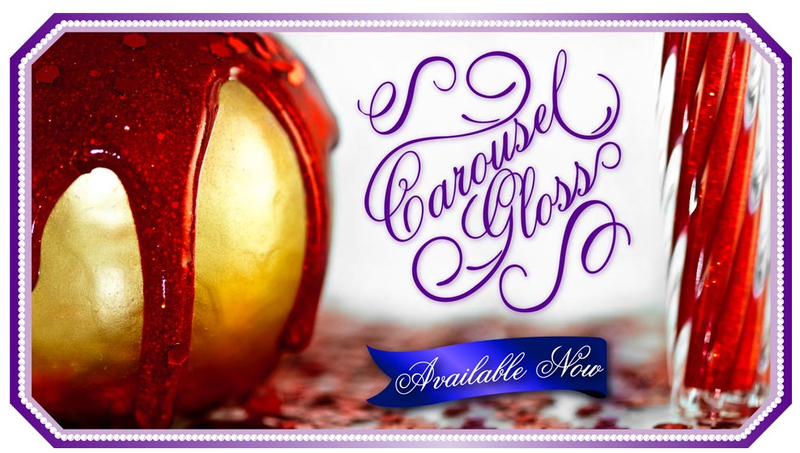 Each gloss arrives in a sumptuous purple foil box resembling an antique merry-go-round — the ultimate gift (or indulgence) for those seeking a little luxury in their makeup bag." Review: I love these and want more! The shade I got is Golden Ticket, the pigmentation is amazing, the color range is amazing and the packaging is amazing! The only thing I really don't like about these is the sticky feeling. These are VERY sticky! And they have to be to pack that much of a punch when it comes to color. I really want Loop-de-Loop, Kaleidoscope and Candy Apple :D Gotta hurry those because these are Limited Edition and will be going away sometime in February. Also, they smell like Vanilla :D Deliciously sweet! Next is Eyeshadow, I got two shades: Circus Girl(yellow) and Empress(purple). Circus Girl is my favorite out of the two, it is now my go-to yellow(much brighter than Sugarpill's Buttercupcake IMO). Description: "Immerse yourself into the world of fantasy with a collection of multi-purpose Magic Dusts, inspired by our favorite fairy-tales and mystical creatures! Designed for dreamy, aetherial effects on your eyes, lips and cheeks, these loose eye shadows combine intense pearlescence with just a touch of underlying color. Each Magic Dust comes in a no-spill purple unicorn container." Review: I wasn't to excited about these to be quite honest. I did a lot of research, looking for swatches and reviews, before I decided which colors to pick and I didn't find a lot of shades that I liked. But they are very pigmented and versatile. These shadows are safe for lips as well so that's a bonus. I really wanna try Dragon Scales, Medussa and Troubadour. Last, but not least, there is the Candy Eyed Eyeshadow Helper. This stuff is friggin epic! It blows TFSI out of the park! Don't get me wrong, I still love my TFSI but this stuff eliminates the NYX JEP middle man! As you can see from the swatches above the Eyeshadow Helper makes the shadows much brighter, you can especially see this in Empress. Description: "No other Eyeshadow primers work for you? Meet Eyeshadow Helper: formulated to withstand heat, sweat and even the oiliest of eyelids, this waterproof eyelid primer is guaranteed to keep your Eyeshadow ON no matter what!" Review: As I said above, this stuff is way better than TFSI. First off same price for a better product, awesome! Second, way cuter packaging! Third, this is a stickier cream product that allows the shadows to adhear to the lid as well as making them crease-free all day long. No lie. I recommend this to EVERYONE. So, I will defiantly be purchasing some more products from Lime Crime and I recommend this brand to anyone who isn't afraid of color! Thanks for the review! I've definitely seen some goodies I need to get my hands on. Great review, the lipstick and lipgloss are very bold colours but still very pretty! Thanks for the review. I really want to try Eyeshadow Helper! 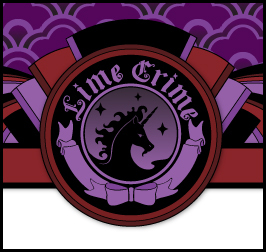 I love Lime Crime products - I own loads of their lipsticks and magic dusts! I really want to try one of their lip glosses, but for me the golden ticket is the Primer - I actually do not know what I would do without it - I wish they made one for all over your face like they used to! Oh my gosh I have Lime crime's shadow helper too and I feel the exact same way! I've done UDPP, TFSI, NYX HD eye primer, E.L.F, etc. Nothing comes close to Lime Crime's! Also, Medusa is gorgeous and so worth getting. My Beautiful rocket is fantastic, and Top Hattie eye shadow is the best eye highlighter ever! The lipgloss definitely looks interesting but just reading on some of the controversy that plagues the company (especially this: http://portraitofmai.blogspot.com/2012/02/lime-crime-you-still-havent-learned.html ) makes me believe while Lime Crime might've changed from less than stellar quality it used to have, but Doe doesn't seem to have changed, and there are too many good indie companies without the dubious pasts that I could give my money to.